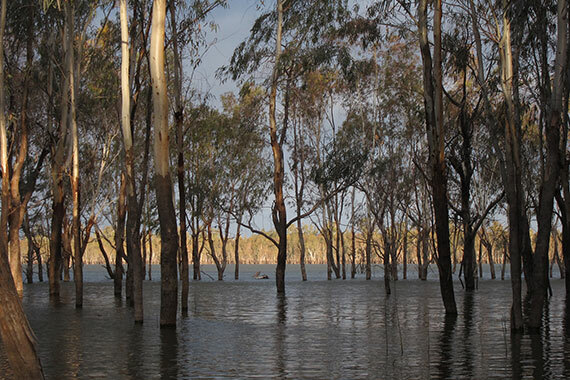 All of the 12 Ramsar-listed Hattah Lakes received environmental water over 2013–14 and 2014–15, including Lake Kramen, which sits high on the floodplain surrounded by an important black box tree community. Four sites in Victoria have been identified as 'icon sites' for restoration. These sites include Lindsay-Wallpolla Islands (including Mulcra Island), Gunbower Forest and Barmah Forest and Hattah Lakes. Environmental watering helped to achieve a range of ecological results for the system, particularly inundating fringing river red gum and black box woodlands, which have been in a stressed condition following the drought. Watering facilitated nutrient exchange between the floodplain and lakes, stimulating a 'pulse' of productivity in the wetlands. The plants, fish and birds using the lakes have thrived and reproduced in response to the watering. With the ability to provide water more frequently to the floodplain, we expect the plants will continue to improve. Another significant observation was seeing cormorants breeding on the lakes for the second consecutive year. Cormorants and darters have been in the region in small numbers in recent years but this is the first time breeding has been seen in about 10 years. The watering also connected the lakes, allowing fish to move in and out. Murray cod, golden perch and silver perch were recorded in the lakes. A prominent local apiarist said bees produced excellent honey after being rested at Hattah Lakes when environmental water is in Chalka Creek and the lakes. "Watering Hattah Lakes has achieved some remarkable and beautiful results, which has been made possible by working closely with the community and partner agencies," Mallee Catchment Management Authority chair, Sharyon Peart, said.